Have you heard the GIANT news? We’ve launched our PandaCam presented by Hainan Airlines! 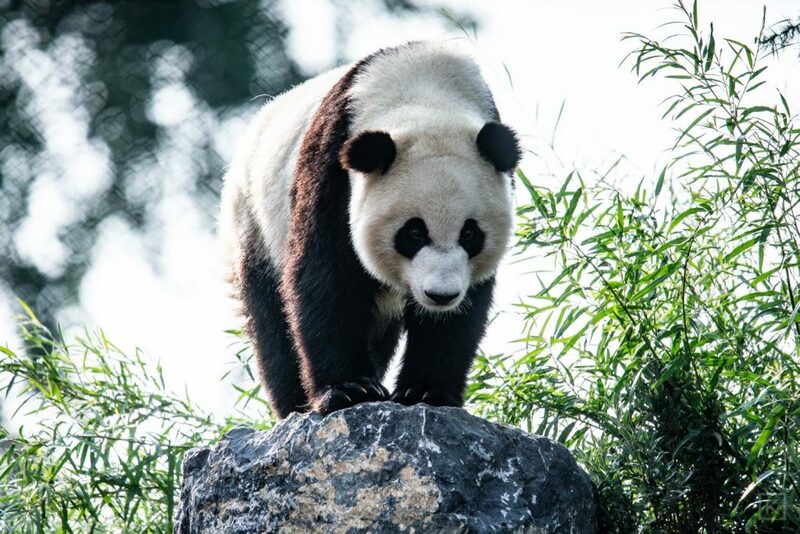 Now you can see what our giant pandas are up to even when you’re not at the zoo. If you have any questions about what you see on the PandaCam or our pandas in general, make sure to read our FAQ’s below. When is the PandaCam active? The PandaCam will be live everyday from 9 a.m. to 6 p.m. 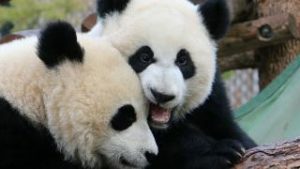 When the PandaCam isn’t live, you will be able to watch a highlight reel of some of our favourite giant panda moments. Why can’t I see the pandas? If you can’t see the Pandas, it is because they are doing their normal panda activities beyond the range of our PandaCams. We only have three cameras set up, one outside and two inside, and are therefore unable to capture the entire habitat and all panda activity. 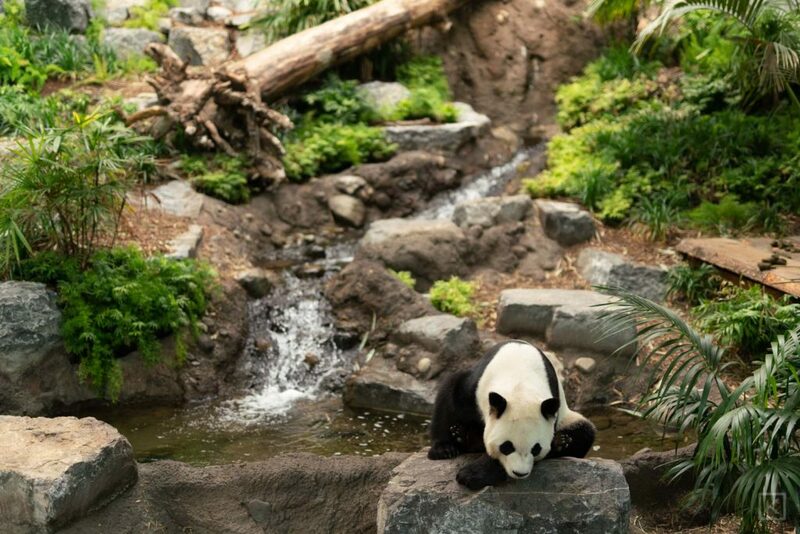 The best way to ensure a panda sighting is to visit the zoo! Why isn’t the PandaCam working? Don’t worry! If the PandaCam isn’t working, it is mostly likely down for maintenance and will be active again shortly. Why is there a person in the panda enclosure? Spotted someone in the enclosure? That is one of our Animal Care staff who maintain the habitats for our pandas and our other amazing animals! They enter the habitat to clean them and set up enrichment opportunities for our animals. Why do pandas eat so much? 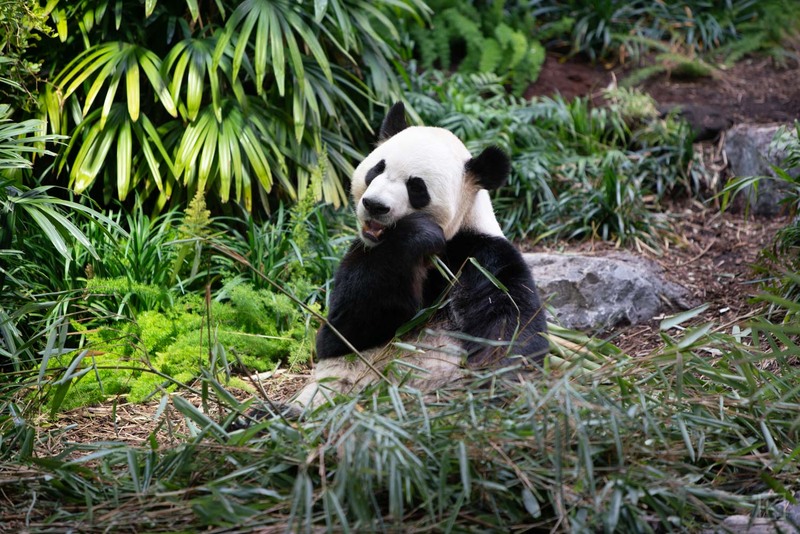 Giant pandas can eat anywhere from 20 – 40 kg of bamboo every day! This is because a panda’s digestive system is more like that of a carnivore than an herbivore, resulting in much of the food it consumes being passed as waste. Consuming enough food to receive all the necessary nutrients takes time. Our pandas can spend anywhere from 10 to 16 hours a day eating. Where does the zoo get its bamboo from? Thanks to our sponsorship with Hainan Airlines, we receive sustainable and ethically-harvested bamboo directly from China twice a week! The complete process, from harvesting in the high mountains of the Sichuan province to our habitat for the pandas to eat, only takes approximately 48 hours. The best part? The bamboo is transported on pre-existing Hainan Airlines commercial flights to Calgary so there is no impact on our ecological footprint! Why do pandas poop so much? Can you imagine how much you would poop if you ate 20+ pounds of food a day? Pandas pass so much food that they even continue to poop while they sleep. Why do pandas sleep so much? When pandas aren’t eating, they’re sleeping. Pandas sleep for around 10 hours a day in two to four hour intervals. Pandas have difficulty absorbing nutrients from the bamboo they eat and compensate by requiring less energy through sleeping more and moving less. No, unlike other bears, pandas do not hibernate. Like with sleeping, this has a lot to do with the panda’s diet which does not allow for it to gain enough weight to hibernate. Which panda am I watching? Da Mao is bright white and the biggest of the four pandas. Er Shun is beige-coloured, especially on her back and is finer boned with a smaller head than Da Mao. Da Mao has bright white fur and is the biggest of the four pandas. Jia YueYue has square-shaped eye patches that extend into the bridge of her nose. Jia PanPan has a broad nose and oval-shaped eye patches. Up until recently, giant pandas have been on the endangered list with just over 1100 left in the wild in the 1980’s. But in 2016, giant pandas were downlisted from endangered to vulnerable with an population increase of 17% over the past decade. This speaks volumes to the conservation work taking place all over the world to protect them. How do the pandas handle the Calgary weather? Pandas live in the mountains of central China and are used to dealing with chilly weather so when it snows here in Calgary, our four giant pandas feel right at home! The pandas arrived at the Calgary Zoo in spring of 2018 and the adults, Er Shun and Da Mao, will be with us for five years. The cubs will be departing in fall 2019.